I learn, therefore I am. Learning plays a variety of roles in successful organizations. …that says life has to be serious. Performing is one of my passions, and for clients that means I take a dynamic and engaging approach to any meeting or learning event I lead. I guarantee participants will be actively involved – and they’ll have fun in the process! Get your board and education/professional development committee excited about the possibilities effective learning offers the organization! Provide your SMEs the knowledge and skills they need to provide more valuable learning experiences. I can deliver an existing program about aspects of effective learning or customize a program to meet your organization’s specific needs. If your organization is facing challenges or opportunities and could use the support of a skilled facilitator to explore options, I will work with you to design and facilitate a session to help achieve your goals. And because I’m a passionate lifelong learner ? if you don’t see the program you need, I would love to create a new program just for you on the learning topic that matters most to your organization. My engagements have included facilitating staff/committee/board meetings, strategy sessions, and retreats as well as leading conference/convention workshops, concurrent sessions, and virtual learning opportunities. Specifics depend on client need; most topics can range in length from 90 minutes to a full day or more. Please contact me for details about options and availability! Can learning and logistics successfully coexist? Imagine this scenario: people engaged in conversation about what matters…shared understanding and discovery emerging…building on each other’s knowledge…new ideas and choices arising that may never have existed before. Then imagine yourself contributing! 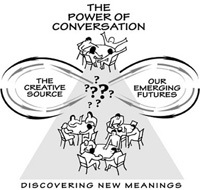 Participants in Conversations that Matter create their own learning journeys via fun, engaging, creative conversations exploring questions that matter to them. For this unique experience, I work with you and your stakeholders to identify one or more powerful questions focused on possibilities. Then, I host the conversation using a proven process for participant-driven discovery and innovative thinking known as the World Café. Afterward, I can work with designated stakeholders to develop strategies for the insights that emerge. Consider using a café conversation for a general session or breakout during a larger conference. For deep insight and understanding about possibilities for major issues facing your organization or its industry/profession, bring together your stakeholders for a stand-alone café that lasts a half-day, full day, or longer. Please note: café conversations require a specific room set-up, a minimum of 16 participants, and duration of not less than 90 minutes. A café length of 2-3 hours is preferred so that participants can more fully explore the possibilities they create together. Contact me to learn how a World Café conversation might contribute to your organization!